I’m finally working in Kalamazoo. I know I’ve mentioned it in passing, but late last month, my company opened an office in Kalamazoo and I got transferred down here. No more nights and weekends. No more spending two hours in a car commuting back and forth to Grand Rapids every day. It’s given me more time at home with my family and dropped the overall stress level of both my wife and me. When I first started working in Kalamazoo, I kept hearing about a coffee shop not too far away from my office that most of the downtown workforce knows well. In the seven years I’ve lived in Kalamazoo, I don’t know if I even realize this place existed, but as soon as we moved in downtown, I knew it was going to be a place I was going to get very familiar with. 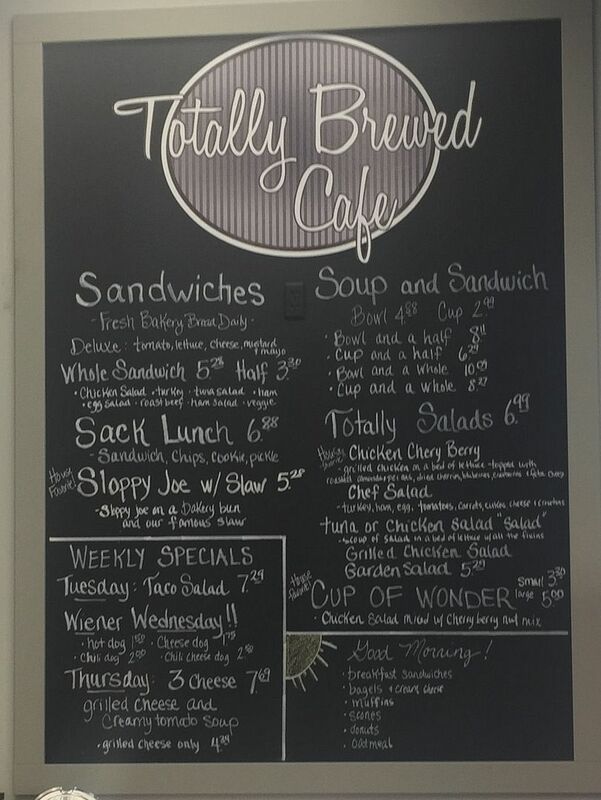 Totally Brewed Cafe has been in the Comerica Building in downtown Kalamazoo for about eight years. 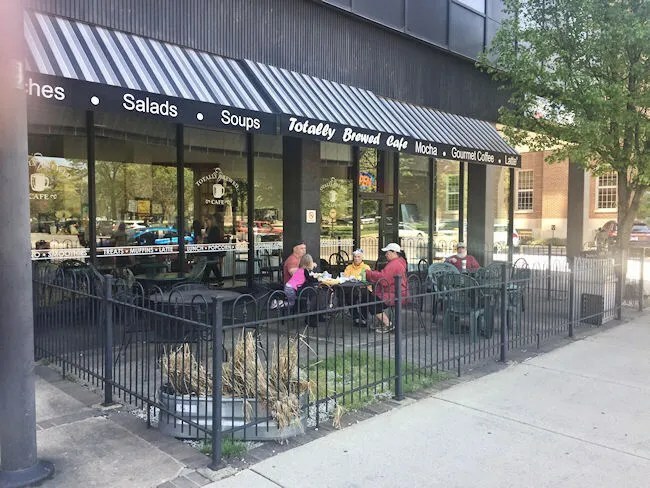 The small cafe sits right on Rose Street across from the Kalamazoo County Courthouse just south of the very busy intersection at Michigan Avenue and Rose Street. The main entrance to the cafe is actually through the main doors of the Comerica Building. If you got through the revolving doors, the cafe is immediately to your right when you get in to the main lobby. There’s also an entrance through the patio but that is used as more of an exit. During busy times, the line can stretch back towards Comerica lobby so it’s best to enter through there. 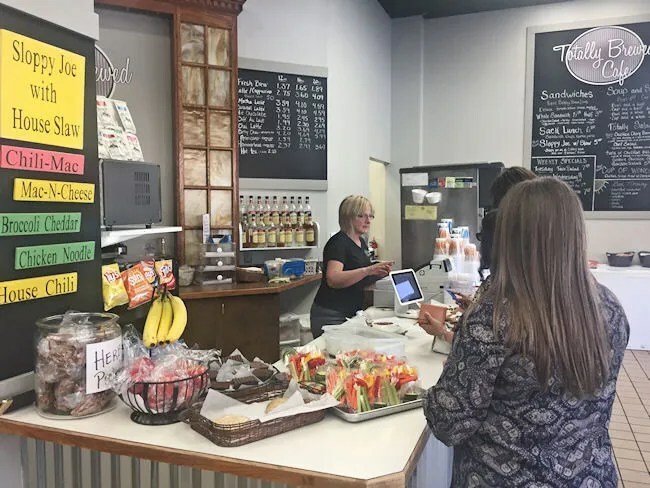 The cafe isn’t very big and they don’t offer a wide variety, but the shop is immensely popular with the tenants of the surrounding buildings. 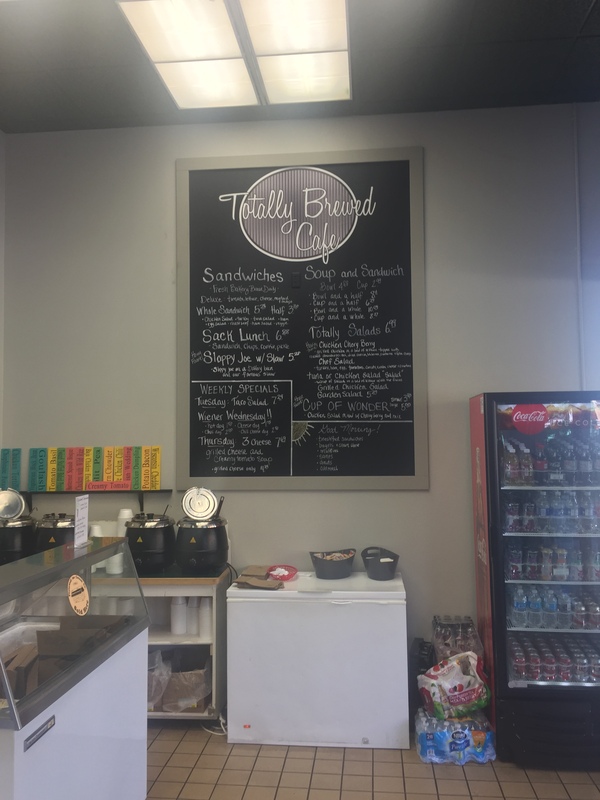 The limited menu includes coffee, smoothies, sandwiches, salads, and soups as well as some baked goods. It’s all pretty standard breakfast and lunch fare, but it’s all done as such high quality. The line was fairly short when I stopped in on a Friday afternoon for lunch. I was still looking over the menu hanging on the wall when I heard a voice from behind me ask if I had decided yet. I was still kind of reading the menu, but it was actually the specials that drew me in on this day. They were listed on a sandwich board outside, but they also hung on colored construction paper near the cash register where a lady was ringing orders up as fast as she could while the other employees were taking orders and putting them together to keep the line moving. My pick for the day was a bowl of Chili-Mac and the Ham, Cheese, and Pesto Grilled Flatbread which comes with or without a house made slaw. The meal was bagged up very quickly and set down on the counter. The meal, without a drink, set me back a little over $11. 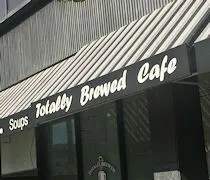 There is seating both inside and outside at Totally Brewed. The inside seating is in a little space between the counter and the floor to ceiling windows that look out on to Rose Street. There is a chest high counter with pub height chairs that you can sit and look out the windows on gloomy days if you don’t want to sit outside. 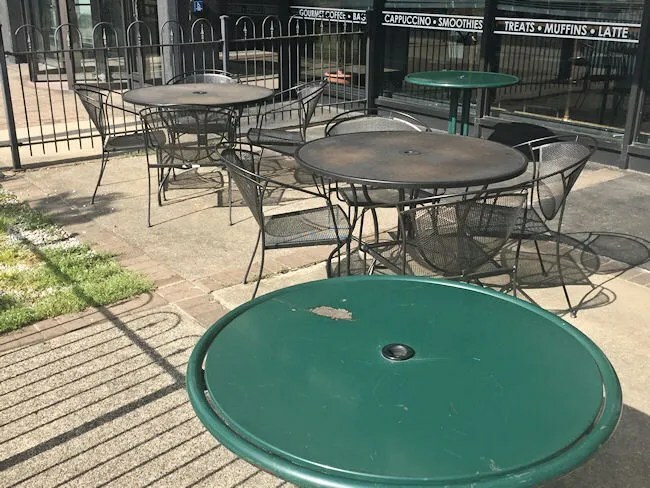 On nice days, there is a great patio right out near the street with several tables. I see this area full almost everyday when the sun is out. I opted to take my meal back to the office. When I got back, I opened the bowl of chili mac first. 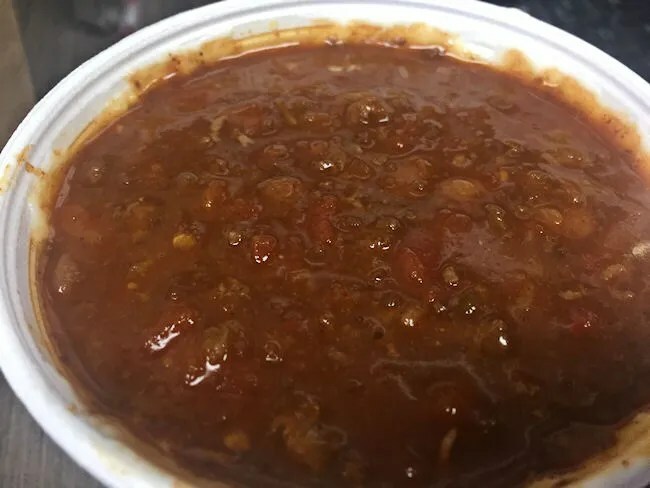 At first, it just looked like a bowl of chili. 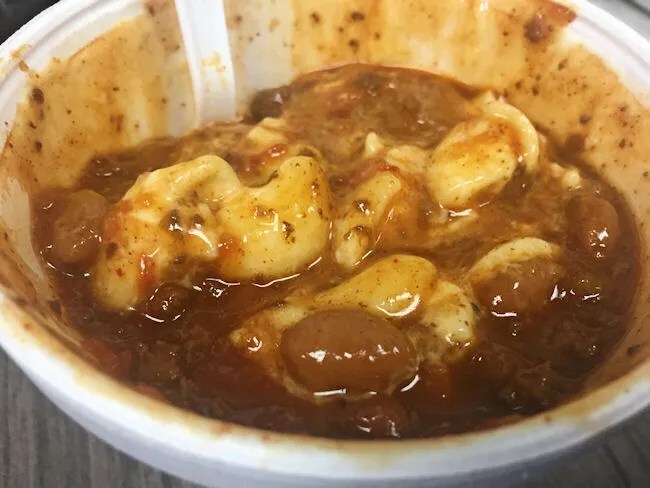 I thought maybe she grabbed the wrong one, but then realized, I’d probably have to dig down deeper to find the “mac.” The chili that was layered on top was a delicious chili with hamburger and beans. I didn’t pick up a lot of veggies although I could see some celery and small tomato chunks. Underneath that layer of chili was a deliciously creamy layer of macaroni and cheese. The combination of the smooth, creamy and meaty, hearty chili was fantastic. I could have eaten a lot more than the bowl that contained all this deliciousness. I was a little hesitant when I ordered the sandwich, but I thought I’d give it a try. I’m so hit or miss with pesto. Sometimes I love it, sometimes I hate it. On this sandwich, I loved it. 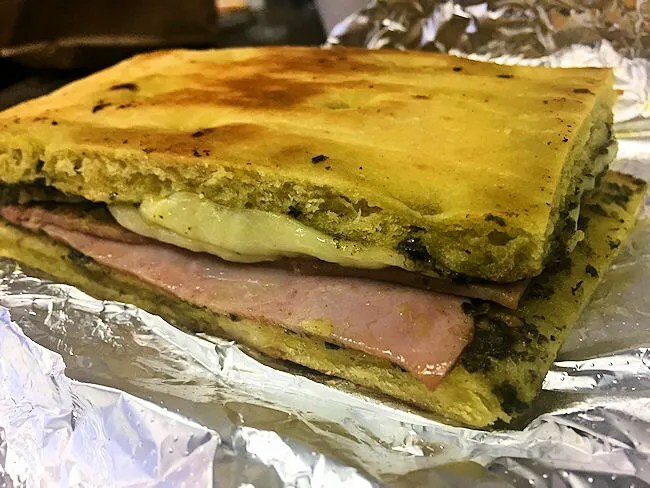 The home made flatbread is layered with ham, Swiss cheese, and a thin spread of this home made pesto then pressed until the bread is crispy on the outside, but still fluffy and flavorful underneath that crisp. I was truly surprised at how much I liked this sandwich. It doesn’t look like much, but the pesto added so much flavor to what could have been a boring, simple sandwich. There’s a reason places like Totally Brewed Cafe do so well in locations like this. They cater to a very specific clientele who work in downtown office buildings. These are the kind of people that take walks on their lunch breaks and look for a cheap yet delicious option for lunch that doesn’t include deep fryers. This is the first time in my life that I’ve worked in a downtown setting and so far it’s been great. With places like Totally Brewed around me, it’s going to be hard not to fall in to that pattern of eating out every day.